Alaska is described as having Tanana earth. This term is typically used to describe an area where the soil is poorly drained and contains permafrost less than 5 feet below the surface of the soil. Alaskan soil is made up of silt, sand and gravel. The soil make-up is largely due to erosion caused by glacial ice, permafrost, and frozen rivers. Soil is classified into groups, or orders, based on its properties. The properties of soil refer to its texture, moisture content, organic content, and pH level. There are twelve soil orders: entisols, gelisols, histolsols, vertisols, andisols, inceptisols, ardisols, mollisols, alfisols, ultisols, spodosols, and oxisols. Gelisols describes the majority of soil in the Alaskan tundra. Gelisols are typically found in high latitude polar regions. Gelisols are divided into three subcategories. Histel gelisols contain large amounts of organic matter. Turbel gelisols are produced as a result of mixing by frost action. Orthel gelisols are the most common and are soils that do not meet the criteria for histel or turbel gelisols. Alaska is the most diverse state when it comes to soil types, containing seven of the twelve soil orders. Andisols are also found in Alaska and are a result of volcanic ash deposits. New soil with little development, or entisols, are another soil order of Alaska. Other soil orders found in Alaska are histosols, inceptisols, mollisols, and spodosols. The properties of the soil order determine the types of ecosystems which can be supported in that region. If the soil is too cold or does not get the proper nutrients, water or light, the vegetation will not thrive. If the vegetation cannot thrive, the ecosystem is likely to be effected. The soil in Alaska tends to be higher in organic matter, meaning it contains more nutrients. It also contains less toxins and contaminants compared to soil in more industrialized states. But the vegetation must be able to survive the poor drainage of the soil and withstand the cold temperatures of the tundra. 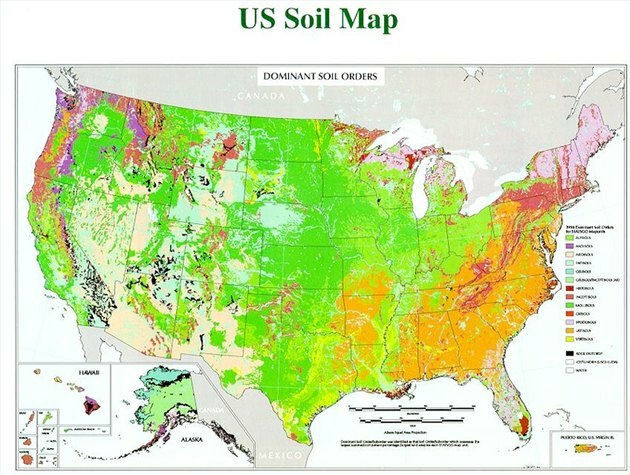 What Type of Soil Is in Missouri?